I was given the chance to review Purex free and clear Triple Action laundry detergent recently, which is the newest formulation they've come out with for this detergent. In fact, on the front of the bottle it said, "new & improved." I got my bottle for free, since I am a Purex Insider. However, one of the things I really like about Purex detergent is that it is so inexpensive you can often find it for free if you combine sales and coupons! For example, I recently saw a sale of buy one get one free, and when you combine that sale with coupons all of a sudden they're practically paying to you to take this detergent out of the store! My only real complaint with this version was that it didn't do quite as good on stains that I didn't pretreat as I would have liked. However, it did a great job removing odors and removed general dirt well. I still think All free and clear is a great deal, for the great way it cleans and the low cost. However, Purex costs even less and works almost as well, so as long as you're prepared to be vigilant to pre-treat all stains this may be an even better choice for very price-conscious consumers. And, as I said, if you take advantage of sales and use coupons, you can often get Purex for free! I would gladly use as many jugs of this detergent, for free, as I could get, so I definitely plan to use it again when I can load up on deals! I'd love to hear from even more people who've used the new Triple Action version of this detergent, in any of the available scents (or unscented) to share what you think about it. You can share your Purex review here, or read others that have already been submitted. 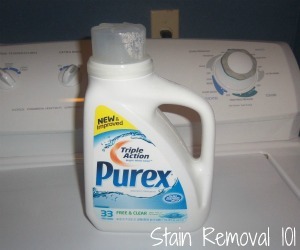 Jeanne has provided a Purex Free and Clear detergent review. I've tried lots of unscented laundry detergents before, figuring one was just as good as another. I need to use unscented since my family all has allergies to fragrances and perfumes, and I prefer the clear in case of any allergies to dyes. Then, one day, our local supermarket had a sale on Purex detergent. I had bought Purex in the past, regular Purex, before I switched to unscented detergents. This time I noticed they had one that was Purex free and clear of dyes and perfumes, so I purchased a bottle. My son had some teeshirts that he wears to bed at night. A few of them he stopped wearing because they had developed a strange odor which bothered him. Since I have a poor sense of smell I didn't notice it until I sniffed them closely and could tell what bothered him. It was a strange odor! On a whim I threw one of those in the laundry when I first used the Ultra Purex free and clear. After the load washed I tossed them in the dryer until they were dry. As I was folding the dry clothes I came across the teeshirt that "smelled". I held it to my nose and took a whiff...no odor! None! When my son came home I asked him to smell the teeshirt...and he couldn't smell any foul odor, either! I gathered up the other few teeshirts that had picked up that smell and washed and dried them, again using the Purex. The odor was gone. Completely. When the Purex was running out I purchased a different brand of detergent that was on sale. For some strange reason, after a while, that bad smell came back in the teeshirts. So once again I bought the same Purex free and clear and once again, it removed the bad odor. It's the only detergent I purchase now. We have no allergic reactions to it, clothes are left smelling fresh and clean, with no foul odors. I haven't noticed anything different regarding wear and tear on clothes from the detergent - the main difference has been no foul odors on clothing. 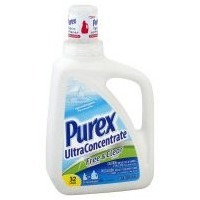 Thanks Jeanne for your Purex Free and Clear detergent review. It is good to find a product that works well when your family suffers from laundry detergent allergies. I am interested in hearing other people's opinions of Purex too. You can share your Purex laundry detergent reviews here, or read others already submitted. In addition, you can share other laundry detergent reviews here, telling me which detergent you think is the best (or the worst). Jessie provided this Purex Free & Clear Laundry Detergent review. I tried using Purex Free & Clear for my boyfriends clothes, because my regular detergent was making him itchy. While the clothes looked clean, and I didn't see any stains or anything left on them, they all still reeked of cigarette smoke, as if I had simply soaked them in water. It was fainter but most definitely still there. I could also still smell some of "his" scent in the clothes as well, not that it's offensive, but when that is left behind it makes me wonder if the clothes are really clean. I like other Purex detergents. For example, I have used the Natural Elements Linen and Lilies scent for my clothes many times and never noticed that problem, but then I don't smoke. Thanks Jessie for your Purex Free & Clear laundry detergent review. I think it is interesting that Jeanne, another reviewer, felt like it was really good at removing odors. I would love to hear from other people, giving their opinions about how it removes odors to get some more points of view. If you use Purex laundry detergent you can share your Purex laundry detergent reviews here, or read others that have already been submitted. In addition, you can share other laundry detergent reviews here, telling me which ones you like, or don't, and why. 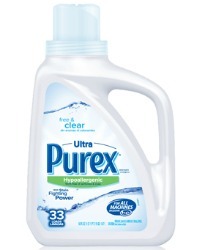 Ultra Purex Free & Clear's New & Improved Formula Is Not for Me! I have used Purex Free and Clear for a long time and have been very satisfied with it. Recently when I purchased a new bottle I found that the formula has been changed. My allergy symptoms returned when I used this new formula, and I find myself back at square one. I want my old Purex back! Thanks Carol for sharing your experience with the new formulation of this detergent. I tried to find what new formulation they might have, and what I saw is that Purex has reformulated all of their detergents recently to be "dual compatible," meaning that they work both in HE and more traditional washing machines. Overall, being dual compatible is a good thing, since you don't have to have two versions of every single detergent, or accidentally pick up the wrong one depending on your machine. However, if this formulation has caused your allergy problems that is a real bummer. Carol, I recently was given the opportunity to try Purex with Zout, in the free and clear version, and I liked it pretty well. Unfortunately, I have been unable to find the free and clear version in stores since I ran out of my free jug, so I haven't bought it again. Each person has slightly different laundry detergent allergies, and as you can tell, even some hypoallergenic detergents won't work for everyone. You may want to check out my list of hypoallergenic detergents here, to see if you can get some ideas for new ones to try now that Purex Free and Clear no longer works for you. I would love to hear from others who have used this detergent. Have you experienced any problems with the new formulation? 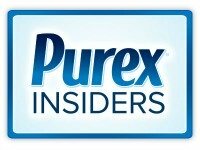 You can share your experiences with Purex laundry detergent here, or read other reviews which have already been submitted. Comments for Ultra Purex Free & Clear's New & Improved Formula Is Not for Me! This detergent works "ok" for light to medium soiled laundry. I had to switch to a free and clear due to my daughters excema, so I thought I'd give it a shot. It does not remove heavier stains from things like dirty white socks, (my 9 yr old son's), or stained whites like t shirts and white polos. I tried using a tide with bleach booster in the white/light load of my kids today, so hopefully that will do the trick, though I had to double rinse the load because I am not sure yet just what is triggering my daughter's excema, so I wanted to make sure all the detergent+booster rinsed out. If the booster didn't work, I will have to wash my daughters clothes separate from my sons. (more work for Mom). It works for her light-medium soiled clothes, so I will finish the bottle. Trish, sorry you didn't think this product worked well for you. I have been pretty happy with it myself, but I totally get if you're not happy with something needing something new. I also want you to be able to wash everyone's clothes together since it is a big pain to wash clothes separately. There are actually a lot of stain removal products and non-chlorine bleaches available that are hypoallergenic, you just have to know what to look for. Here's my list of hypoallergenic laundry products, including bleaches and stain removers, that can hopefully help you with tougher stains and soil, while still not having scent or added dyes. Good luck! I have used all kinds of detergents over the years with no problems. I purchased Purex Free & Clear w/ Dirt Lift Action because it was on sale, not because it was hypoallergenic. I was itching for about a month before I figured out what was causing it. So I have had to rewash everything because I don't know what I washed in it or my other detergent. I still had some of the other so I have continued using it also. I only figured it out about 2 weeks ago so I have stopped using the Purex (gave it away) and switched back to my original brand (the cheapest stuff you can buy). I am still itching, with no relief in sight. I have tried washing with a small amount of detergent, then rerunning the complete cycle in plain water, even that doesn't help. I don't want to have to go to the doctor, I have tried cortisone cream, with very little effect, working only about 5 minutes and then right back to itching. I read in one post someone said to use Benadryl, never thought of that. I will pick some of that up to see if it will help. Any thoughts or suggestions? I think this product is excellent and getting ALL your laundry clean and fresh. Even thought it's unscented it gets all odors out. I will buy this product again. I often use the original Purex and like it. I switch between Purex original and Arm & Hammer Clean Burst. I will be adding the Purex free and clear to my laundry detergent line-up. I've been using Purex Free and Clear Laundry Detergent for the last month for my sheets, pillowcases and towels, and have been having a severe skin reaction on my face. I have used powdered Purex in the past, and never had a reaction. I am wondering if anyone else has had this problem. I purchased another detergent, which I am now using, to try to determine if there is a difference.